Breadboards, also called prototyping boards, are used to construct circuits. Some circuits can be simple and others complex. 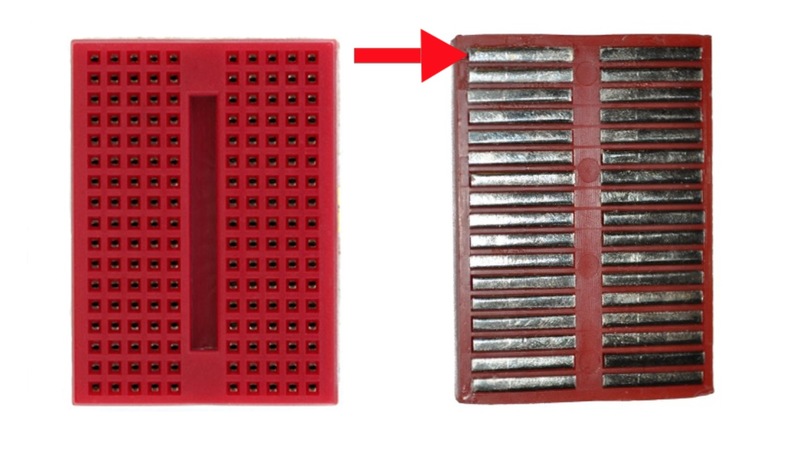 The small breadboard is shown below. This board has 2 columns and 17 rows. The rows are separated by a space in the middle called the centerline. The red arrow points to the underside of the board. Notice that the 2 columns of rows are not connected. Each side has metal spring clips that are tin-plated with phosphorus bronze. Breadboards come in a variety of sizes. The holes in them can be round or square. Jump wires connect components on the board. Components can include batteries, lights, fans, speakers, or sirens. Jump wires come in many colors and lengths. It’s common for a red wire to indicate positive (+); a black wire to indicate negative (-). After reading the information above, students will be quizzed on the words shown in red: positive, negative, components, jump wires, centerline, columns, rows, circuits, breadboards. Here are some simple circuits to build on your breadboard. Project 3: Turn on a fan.